Peanut brittle (dent)"PEYEK"-in indonesian- is one of the foods that are quite popular. In addition to crunchy, peanut brittle that has some of this variation can be enjoyed as a snack or side dish instead of crackers complement. Peanut brittle, or often referred to dent this makes in the fried food. Made from wheat flour mixed with water to form a thick batter, then flavored, and given a filler material such as peanuts, soy, anchovies, shrimp and many more according to taste. 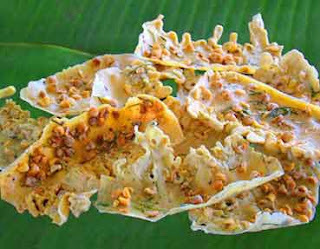 Although it looks like the food simple and easy to find anywhere, but the peanut brittle is still room enough effort income. If you visit Jogja, you can find this tasty food manufacturing business in the district Imogiri, located in the village of Bantul sriharjo. Come on, please visit JOGJA and taste his foods!! It may be helpful to warm cookie sheets in the oven to aid spreading the candy and keep it from hardening too quickly after cooking.